Okay, no carcasses this time. 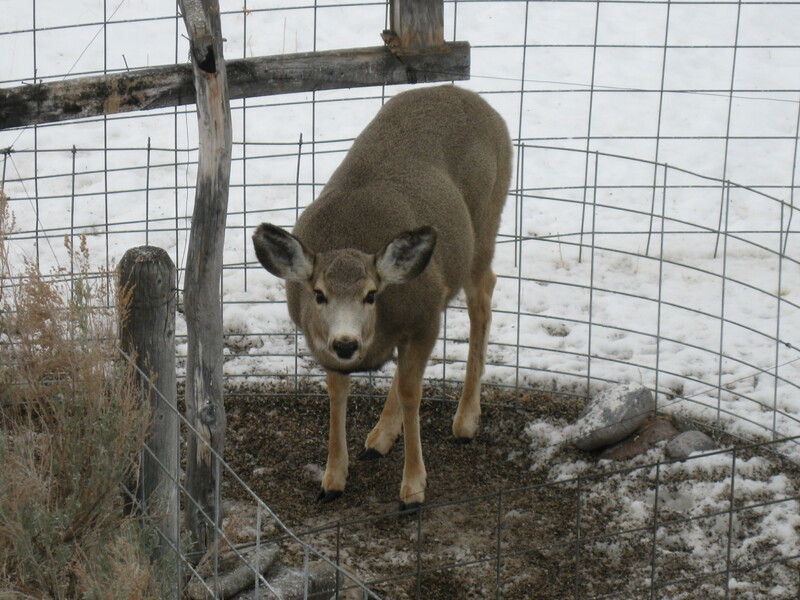 Just an old mule deer doe with the maze-running skills of a champion lab rat. We looked out the kitchen window one afternoon and she had worked her way past Bob’s gauntlet of fence panels toward the prize: the bird feeder. Once at the center of the puzzle, she has to avoid the guy wires that prevent the post from falling over. But the reward comes as she inhales the fallen millet and sunflower seeds. Problem is, it doesn’t stop there. She has been known to knock the bird feeder clear off and stomp on it. We were careful not to go outside the house or let the dogs out while she was inside, lest she panic and hurt herself. Bob actually thought he had her outfoxed with this assembly, but no. Next day he had to improve it, which has finally done the trick. 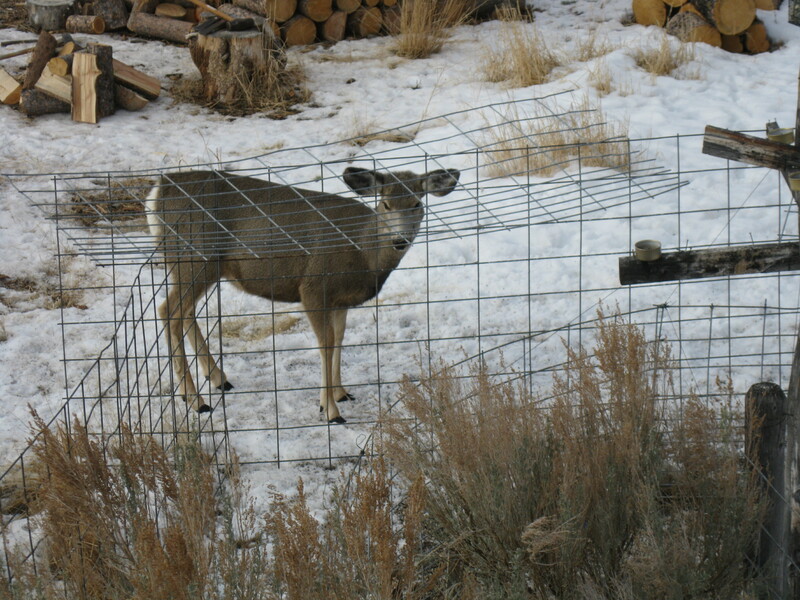 No soup for you, Muley! Bird food is for birds, chipmunks, Ratatosk the squirrel, voles and deer mice. I know, I know: we are already working on a better design so this doesn’t happen next winter. We need a taller, sturdier post that will put the feeder out of reach of a deer on its hind legs. Or something. Next day: Outside and pissed off about it! It appears that Carlson, who founded The Teff Co. and has worked with many growers in the region, saw the Ethiopian from Minnesota as a rival poaching on “his” territory. Tesfa Drar was in the area to talk to local farmers about partnerships. The altercation occurred in a restaurant in Vale. I guess to Mr. Carlson, immigrants from east Africa are a good thing, as long as they buy their grain from a Swede from Caldwell, but not such a good thing if they threaten to actually compete with him. Ain’t free enterprise great? 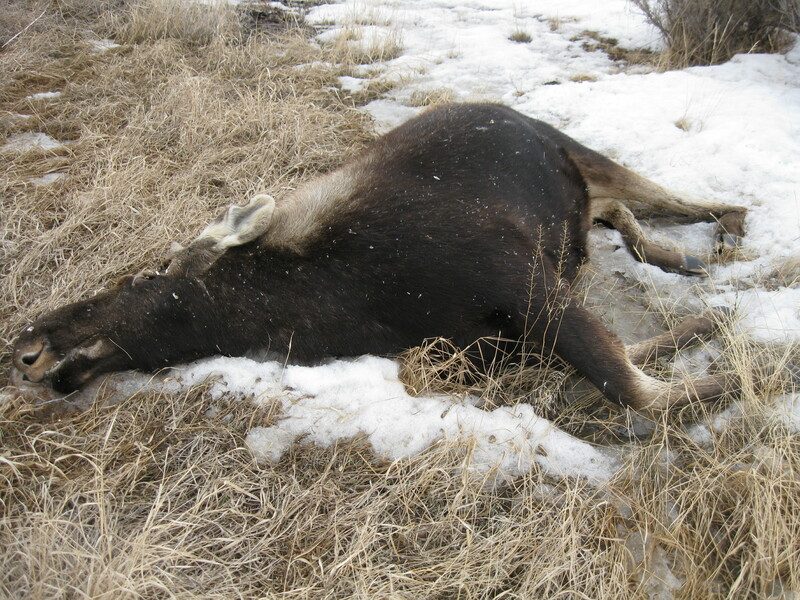 Here is a moose that was killed on Highway 28 just north of Leadore, late this winter. I stopped to take these pictures because I wondered whether the moose had actually been killed by a car, or had been murdered by some motorized nimrod. Moose are so big that they bring out the idiot – never far below the surface – in some of the male apes hereabouts. Moose don’t flee when a vehicle stops nearby. They don’t seem to realize that people are No Damn Good. I felt more than usually sorry about this because the same moose (or its twin) had spent some time ambling around our place; we found its tracks out in the old sheep corrals. And one day I looked out the upstairs windows and there she was, stepping over barbed wire fences in her ludicrously effortless way. I do wonder what killed her – tractor-trailer, diesel pickup? Probably not a hybrid, or we would have read about human casualties. So a young, healthy moose, its best reproductive years still ahead of it, was killed not by the evil wolves [sarcasm alert], but by the only moving thing out there bigger than she was. When I look at the decomposing pile of hair and meat and bone, I think that $10 a gallon gasoline can’t come fast enough. And I wonder, does anyone know where to get some Buprestid (sp?) beetles? I covet that skull, hole or no hole.